One of our amazing customers has conjured up this awesome coffee and walnut cake! Made with our very own ‘must dash’ Colombian coffee, this coffee cake recipe is made using espresso. Make the espresso for the cake and leave to cool. Toast the walnuts in a dry frying pan until they turn golden and you can smell the nuttiness. Be careful not to burn. This shouldn’t take more than a minute or so. Chop 75g of the Walnuts and put the other 25g aside for decoration. Heat the oven to 180C (160C fan) and grease two 20cm sandwich tins. Whisk the butter and sugar together until really light and fluffy. This can take some time but it is well worth the effort for a light cake. Whisk the eggs together and, with the mixer still running, pour in the egg mix very slowly making sure you scrape the mix from the side of the mixer bowl. Once the egg has been added, sift in the dry ingredients (flour, baking powder and salt). Gently fold the dry ingredients in with a spatula or large spoon while also adding the cooled espresso and chopped walnuts. The mix should be fairly thick but still fall of a spoon with some effort. If it doesn’t then add a little milk to the mix to loosen it slightly. Divide the mixture between the 2 tins, and bake for about 25 minutes. Check that they are done by poking a skewer into the cake. If the skewer comes out clean then they are cooked. Allow the cakes to cool for 10 minutes in the baking tins and then turn out on to a wire rack to cool completely. While the cakes are cooling make the espresso for the icing and allow to cool. When the cakes have cooled, whisk the butter until soft, then sift in the sugar and salt and add the cooled coffee. Mix together until evenly combined. Add slightly less than half of the icing to one of the cakes, spreading it across the surface of the cake. Put the other cake on top and spread the remaining icing on the top. Add the saved walnut halves to the top of the cake in any pattern you wish. 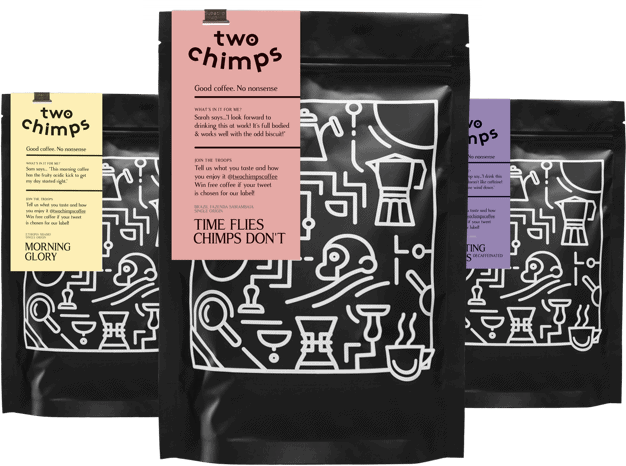 Enjoy your delicious creation with an equally delicious cup of Two Chimps coffee. Have you made something fabuloso with Two Chimps Coffee? We would love to hear from you. Get in touch with the team now.